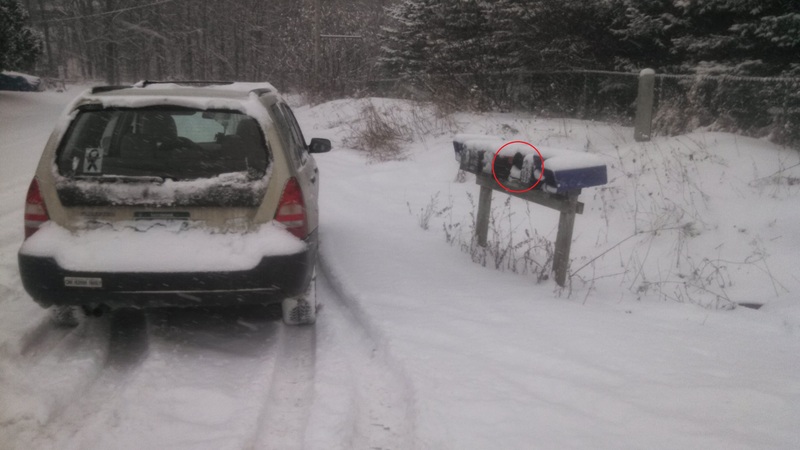 I managed to eke out 15 years and 10 months as a Vermont resident without having someone vandalize my mailbox. That ended today. Someone ripped the door clean off it. See above. I spent a merry few minutes rooting around in the snow to see if it was simply on the ground below the box. No such luck. I hope whomever took it, wherever they are, enjoys it as much as we did these past dozen years (we moved here to this address in April of 2002). The belief that this sort of thing would happen one day is what led me to get a post office box years ago, but unfortunately, some merchants we’ve ordered packages from blithely send follow-ups and catalogs and so on to our street address, so we do try to keep our mailbox functional. I hope and assume that the post office will just hold the mail until I can replace the mailbox in a day or two. For what it’s worth, we have tried just having everything forwarded from our street address to our post office box. That worked for years but then rules changes at the Postal Service apparently made that illegal or bad manners or against policy or something, so they made us stop. That said, I’ll swing by tomorrow morning on the way to work and fill out a temporary forwarding order and we’ll get a new mailbox mounted when it’s snowing like crazy and I don’t feel so rotten from this persistent chest cold.